Emirates may be about to deal a fatal blow to the world’s largest aircraft. Dubai’s national airline is considering switching 20 orders for Airbus SE A380 double-decker jets for the smaller A350 or new-engine variant of the A330, Benjamin Katz and Layan Odeh of Bloomberg News reported this month, citing people familiar with the matter. It’s hard to see how the A380, on its last legs for several years, could survive such a cancellation: Of the 56 aircraft still on order with airlines globally, 53 of them are earmarked for Emirates. But such a move would pose questions for Emirates’ own future, too. After all, it’s turned the A380 into the backbone of its global network since taking its first delivery in 2008. 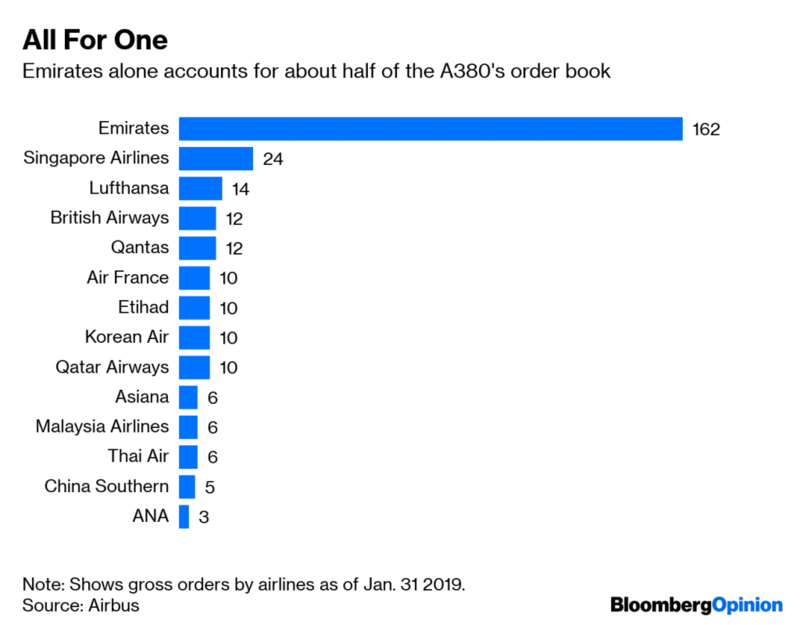 In stark contrast to almost every other major airline, Emirates only has large, twin-aisle, wide-bodied jets in its fleet, with the A380 making up about 40 percent of the total and Boeing Co. 777s accounting for the remainder. 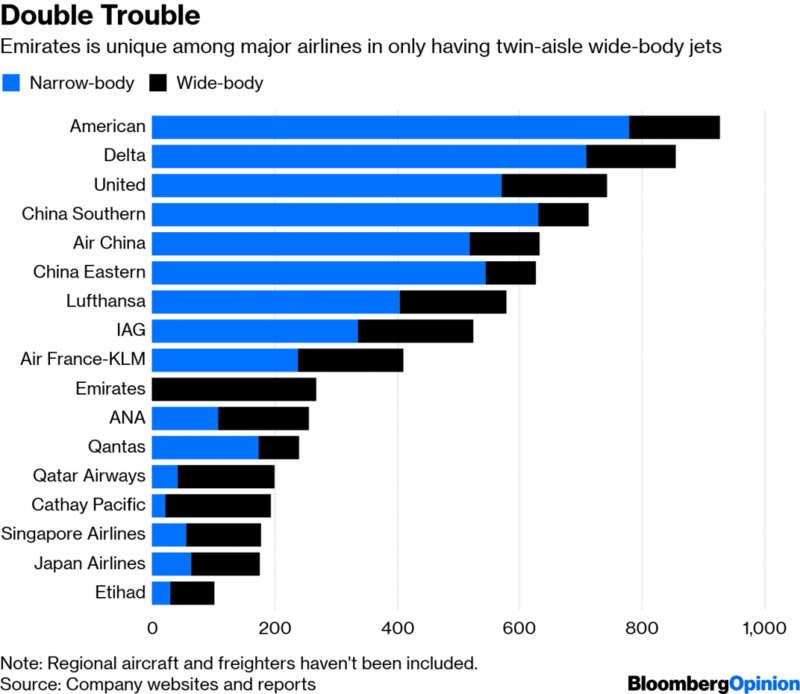 Airlines with big domestic markets in China, the U.S., and Europe are built upon single-aisle A320s and 737s serving popular short-haul destinations and feeding traffic to a small number of longer trunk routes. Other carriers in the Gulf and Asia with a bigger share of long-haul traffic still have a smattering of smaller jets serving the same purpose. It’s not obvious that Emirates’ unusual bigger-is-better strategy made a lot of sense. The argument made by Airbus for the A380 has always been that the growth of global megacities and traffic between them will necessitate bigger planes to make the most of capacity constraints at major airports. 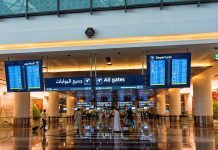 That’s unlikely to be a problem in Dubai, which is planning to build a five-runway site that will be able to handle about three times as many passengers as Emirates’ current hub. More to the point, having big aircraft puts downward pressure on ticket prices. Carriers typically like to fill up at least four-fifths of their seats to maximize the revenue on each flight. The bigger the aircraft, the more discounting and promotions sales teams need to do to hit this target — one reason that the trend elsewhere in the industry has been away from the A380 and Boeing 747. The result is money left on the table. 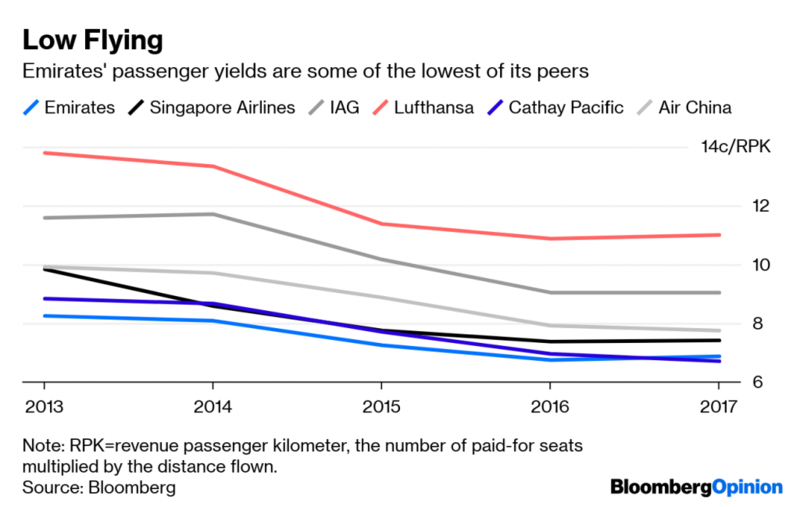 Emirates’ passenger yield — its revenue per passenger, per kilometer — has consistently underperformed rival global carriers for years, with only the struggling Cathay Pacific Airways Ltd. coming close. The experience of Qantas Airways Ltd. is instructive. The carrier struck an alliance with Emirates in 2013 but has since cooled the relationship and upgraded its ties with Cathay as new 787s have given it the option of flying direct from Australia to Europe. The trouble is, it’s hard to move Emirates out of the position it’s got itself in. In terms of maintenance and training, its current fleet of A380s and 777s is vastly cheaper to operate than the chaotic mix of aircraft held by North American and European carriers. Making matters worse, there’s no real market for second-hand A380s, so the traditional way for airlines to refresh their fleet at minimal cost isn’t readily available. And the A380 still has a few advantages. Travelers, for one thing, love it. 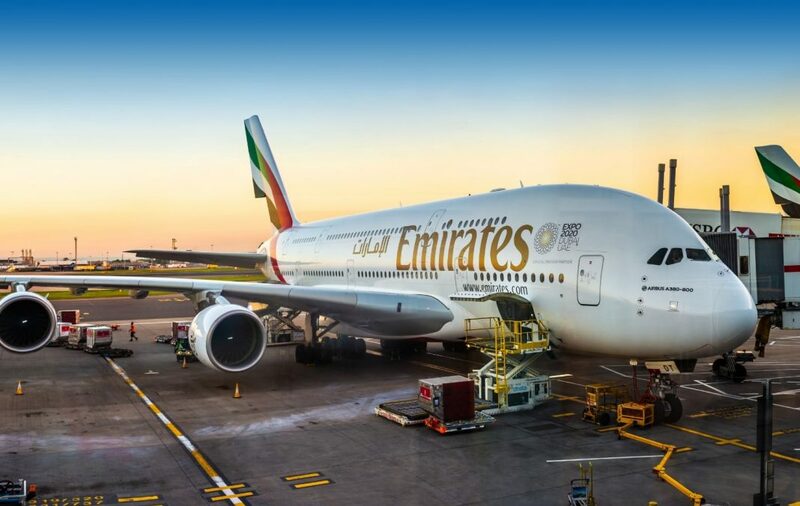 In addition, its vast capacity means that last year Emirates was able to achieve the remarkable feat of increasing passenger traffic while reducing the number of departures on its network — one clear way of improving productivity. Still, it’s hard to escape the notion that the carrier’s fleet of cavernous aircraft is ill-suited to the coming generation of travel, especially as longer-range single-aisle jets like the 737 MAX and A321neo open up fresh possibilities such as transatlantic budget flights. A more likely proposition is that Emirates quietly comes round to the view that small is beautiful. For more than a year it’s had a codeshare relationship with Flydubai, a budget carrier that has the same shareholders but has historically been completely separate. That arrangement lets Emirates buy seats on Flydubai planes, giving it a virtual fleet of 737s that will soon grow to become one of the world’s largest. After Southwest Airlines Co., Flydubai is the biggest customer for the new-generation 737 MAX with 251 on order, and the carrier is expanding its range of destinations deeper into Europe. 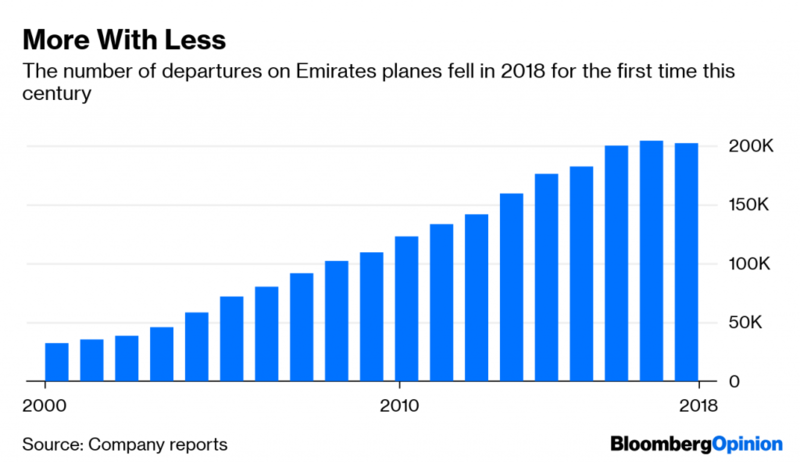 The slow decline of these airborne ocean liners will seem as bittersweet for Emirates as it is for Airbus, and anyone who’s traveled on one. 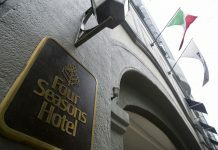 But if Dubai is to maintain its status as a preeminent global aviation hub and Emirates is to extend its enviable track record of profits, it needs to focus on something even more important than first-class showers and business-class in-flight bars: margins.